In this period when the ready-made cars come in galleries with the title of artwork, Gwon made a supercar in bronze. Here, Gwon, an artist who had been doing simple and light works as if he wanted to laugh at the heaviness of sculpture, chose the most traditional way and conservative material that we could think about in sculpture. 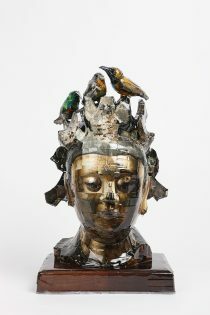 Along with painting, sculpture has been the most important genre in eastern and western arts. Even though they sometimes faced the crisis of being deprived of their title of art, painting and sculpture were always in the center of discourses in art switching the positions in the hierarchy. Even in the middle of 20th century when the wall between different genres in art was broken down, and fragmentary appropriation and mixed hybridization were prevalent, there were artists who persisted in the traditional way of sculpture. 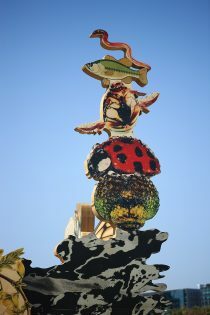 Even though it was not in the spotlight being pushed out by new values of the period, the very ‘sculpture’ survived. 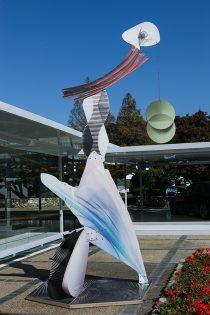 Before Gwon Osang presented “The Sculpture” to the public, it was an open secret that he actually was one of the artists who succeeded to the traditional sculpture. In 1998, when Gwon Osang presented ‘Deodorant Type’ composing a human body with photograph fragments, people thought that it was a contemporary artwork with very sophisticated sensibilities. Even if Gwon announced that he had tried to make a light ‘sculpture,’ ‘Deodorant Type’ seemed to go better with the label of ‘three-dimensional work’ using photography, rather than with the ‘sculpture.’ And 5 years later, when he presented ‘The Flat’ putting photographs in shinning diasec frames, people thought that Gwon was really entering the way of ‘photographer.’ However, Gwon Osang still insisted that ‘The Flat’ was a sculpture. It really makes a perfect sculpture along with ‘Deodorant Type’ in his logic. The story of sculptor Gwon Osang and sculpture begins with the photography sculpture. Gwon Osang was too frail to do the traditional sculpture, trimming stones with chisel and burin, making original form with clay, and casting it in bronze, and he also was too smart to do it in spite of all these hardships. Instead of being suffocated by traditional materials and producing process of sculpture, he searched for appropriate and modern materials which could be used as substitutes. And finally, in photography, he found the link with sculpture along with the contemporary visuality, and its fragmentary property. From Charle-Pierre Baudelaire’s modern eye to Jean Baudrillard’s simulacre, photography is a medium which has been in the middle of the visual conception ruling the modern city. It contains the will to texidermize a transient moment into eternity, and separates image from reality. It was served as a tool to change the episteme of period. If Gwon Osang’s ‘Deodorant Type’ satisfies the obligations of contemporary art depending on the property of photography as a signifier, it appropriates the possibility of transition into sculpture from its reproduction mechanism. On the mechanism of photography and sculpture, he said, “In sculpture, we make original forms and cast them in plaster, which is just like the process of making negatives in film. Moreover, the way we set up the plaster casts and re-make the original form is not different from the printing process of photography. ” Here, he sharply points out that the mechanism of every analog reproductions including photography, after all, cannot choose but appropriate the system of ‘Original-Mold-Reproduction.’ A different approach to the mimesis of photography and sculpture refutes the criticism which insists that the way of representation in ‘Deodorant Type’ is based on the reckless laziness of the sculptor. Admitting that the essential purpose in the starting point of visual arts like sculpture, painting, and photography is the mimesis of nature and object, we could say that it is creative and natural to substitute sculptor’s representation with photographer’s reproduction. 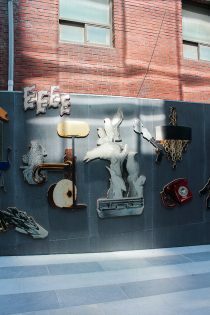 Beyond the common areas in technique and meaning between photography and sculpture, what Gwon Osang presented through ‘Deodorant Type’ was the possibility of new sculpture keeping the pace with the times. 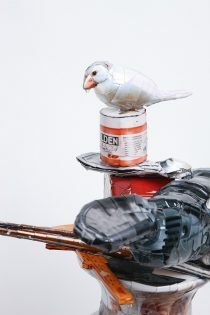 Pioneering a genre of photography sculpture in ‘Deodorant Type,’ Gwon Osang challenges a new one called still-life sculpture in ‘The Flat.’ Now, he calls the popular items in magazine such as watches, jewelries, cosmetics, shoes, purses as objects of sculpture. Considering the number of times these items are appearing in magazines, they are the icons of today’s consumer culture. With these items, Gwon Osang condenses the process of sculpture into the simplest one. While he replaces the heaviness of sculpture with lightness, the volume and density with fragility in photography sculpture, now in ‘The Flat,’ he replaces the complexity in the process of sculpture with simplicity. Cutting out pictures from magazines, and supporting them with iron wires from the back, Gwon Osang puts flat sheets of paper in the three-dimensional spaces to stand alone and grants them the status of sculpture. Here, the more interesting thing is that he ultimately shows us these simple sculptures in the photo plane. He even insists that these final photos are also ‘sculptures,’ which requires more complicated logical reasoning about the property of sculpture than in the case of ‘Deodorant Type’ where he tries to put it into the area of sculpture. ‘Three-dimensionality,’ one of the most important properties in sculpture, is based on the fact that objects that a work tries to represent are three-dimensional. Even if each sculptures that Gwon Osang called for ‘The Flat’ came in the three-dimensional spaces, they are still flat in essence, and so spectators would see them in the right way only when they could be in the front side. Human eyes, however, cannot see this right front side because they also watch the sides and imagine the back considering the spaces. On the other hand, camera lens, the single eye which estimates spaces only with the size, can show us these flat sculptures the way Gwon intended. In short, each sculpture could be seen as a perfect sculpture the way artist wants to show us when it is framed by the camera, and then, it could exist as a solid sculpture. The solid and shinning images of ‘The Flat’ which seem so vivid to our eyes are far away from us covered by various layers of curtain. The objects that they denote are mass produced industrial products whose originals are unknown. 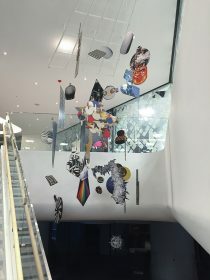 After these products are photographed by camera, the films are developed and printed, mass reproduced by magazine, and framed and casted in camera of the artist, then they finally presented to us. However, as any other things of today, these sculptures whose originals are unidentified appear before us more vividly than the originals themselves, and even than the direct object in the magazine advertisements. In ‘The Flat,’ Gwon Osang is doing an experiment with the possibility of flat sculpture, and he completes the study on today’s images and on the elements happening between them, beyond the relations between vision and illusion, reality and image. After the photography sculpture and flat sculpture. In this period when the ready-made cars come in galleries with the title of artwork, Gwon Osang made a supercar in bronze. Here, Gwon, an artist who had been doing simple and light works as if he wanted to laugh at the heaviness of sculpture, chose the most traditional way and conservative material that we could think about in sculpture. Even though he says that he wanted to show what is sculpture, in front of this huge work, bronze cast of a supercar, ‘Murcielago,’ it is hard to expect the deep impression we could get from Greek sculptures, ‘noble simplicity and calm grandeur’ as J.J. Winckelmann said. 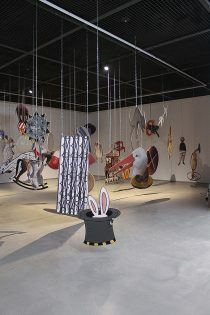 However, from this artist who goes better with the cold reason, and in this period of fragmentation and mental dispersion, it might be nonsense to expect the impressive and emotional work. In front of Gwon Osang’s new work covering a large space around it thickly painted in dark orange, people would rather feel overwhelmed and embarrassed than emotionally touched and impressed. This is somewhat caused by the density contained in the work of the sculptor who keeps studying on sculpture just like unique color developing effects made only by painters who keep studying on painting, or by the visual shock that we could have facing the sculpture sitting low and wide in a space for the first time. However, the root cause of this embarrassment and overwhelmed feeling is mostly in the more psychological part. This is a feeling close to the shivering we could have when something we desire but never expect to happen in real appears just in front of the eyes and the spirit of an age that we could feel when we face a work of art which, in our thought, should be there. 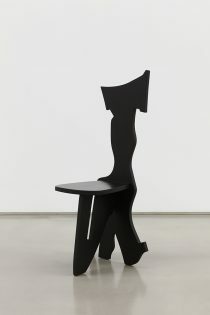 On ‘The Sculpture,’ Gwon Osang said, “In fact, it simply ends with the fact that I made a supercar in bronze.” However, through this short essay, I try to add to his new series a word, “product of ceaseless study on the sculpture which can fit in the new period.” Besides ‘The Sculpture,’ when I look at the new pieces of ‘Deodorant Type,’ and ‘The Flat’ with which he is still working on, I can see that they are denser and harder than ever and find myself stressing their sculpture-ness. Maybe it is partially because I clear up the misunderstandings about artist Gwon Osang’s identity. However more than this, it is because Gwon’s study which started with having ceaseless questions on sculpture and modernity through photography comes close to the answer to how today’s sculpture could feel more sculptural being worthy of the name and deeply impressive. From Gwon Osang’s works, I could feel the period of sculpture arrives. 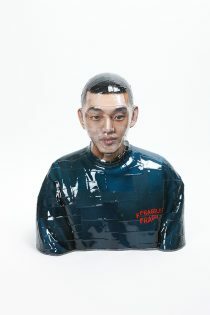 As painting recently led the ‘triumph of painting’ by combining traditional techniques and modern materials, Gwon Osang’s works combining the most traditional techniques with the contemporary age step forward towards that(triumph) of sculpture. Return of the sculpture just began. 레디메이드 자동차가 작품의 자격으로 갤러리에 반입되는 시대에, 청동으로 슈퍼카를 만들었다. 조각의 무거움을 조소하듯, 가볍고 간단한 작업을 지속해온 작가 권오상이 조각이 택할 수 있는 가장 전통적인 방식과, 그것을 연상할 때 가장 먼저 떠오르는 보수적인 재료를 선택한 것이다. 조각은 회화와 더불어 동․서양의 미술사에서 가장 중심이 되어온 장르였다. 시기에 따라 그 서열이 서로 뒤 바뀌기도 하며, 심지어 예술로서의 자격을 박탈당할 위기에 놓인 적도 있었지만, 그 담론의 가운데에는 늘 조각과 회화가 있었다. 20세기 중반에 이르러서는 예술 장르간의 벽이 허물어지고, 파편적 차용과 혼성적 이종결합이 횡행하는 시대가 도래 하였음에도 전통적인 방식의 조각을 지속하는 작가들이 있었고, 시대가 추구하는 새로움의 가치관에 떠밀려 주목받지 못했음에도 말그대로의 ‘조각’은 명백하게 살아 있었다. 권오상이 전통 조각의 명맥을 잇는 작가 중 하나였다는 사실은 “더 스컬프쳐The Sculpture”를 발표하기 전까지는 공공연한 비밀이었다. 1998년, 권오상이 사진 조각들로 인체를 구성하여 ‘데오도란트 타입Deodorant Type’ 시리즈를 발표했을 때, 사람들은 그것을 매우 세련된 감성을 지닌 현대미술 작품이라 생각했다. 그가 가벼운 ‘조각’을 만들고자 했다고 공언했음에도 불구하고, ‘데오도란트 타입’에는 ‘조각’ 보다는 사진을 이용한 ‘입체’ 작업이라는 꼬리표가 어울렸다. 그리고 5년이 지나 번쩍이는 디아섹Diasec 프레임 안에 사진을 담아 ‘더 플랫The Flat’을 발표했을 때, 사람들은 이제 권오상이 정말 ‘사진가’의 길에 들어섰다고 여기기도 했다. 그러나 권오상은 ‘더 플랫’역시 조각 작품이라고 우기고 있었고, 스스로의 논리 안에서 ‘데오도란트 타입’과 ‘더 플랫’은 실제로 완벽한 조각이었다. 조각가 권오상과 조각의 이야기는 사진 조각에서부터 시작된다. 권오상은 끌과 정으로 돌을 깎아내고, 찰흙으로 원형을 떠서 청동을 주물하는 전통적인 조각 작업을 하기에는 지나치게 연약했으며, 무리를 떠안고 전통조각을 하기에는 지나치게 영리했다. 그는 전통적 재료와 제작 과정의 무게에 짓눌리는 대신 조각의 공정을 대신할 수 있는 가장 적절하며 현대적인 재료를 물색한다. 그리고 사진에서 조각과의 연결고리와 함께 동시대의 시각성과 파편적 속성을 찾아내기에 이른다. 보들레르(Charle-Pierre Baudelaire)의 근대적 시선에서부터 보들리야르(Jean Baudrillard)의 시뮬라크르까지, 사진은 현대도시를 지배하는 시각 개념의 원점에 있는 매체이다. 그것은 스치듯 지나가는 순간을 영원한 것으로 박제하려는 의지를 담고 있으며, 이미지를 실재로부터 독립시켜 시대의 인식을 전환한 도구다. 권오상의 ‘데오도란트 타입’이 사진이 가지는 기표적 속성에 의지해서 동시대적 작품의 당위성을 획득하고 있다면, 그 복제의 메커니즘으로부터는 조각으로의 전이 가능성을 차용하고 있다. 권오상은 사진과 조각의 메커니즘에 대해 다음과 같이 이야기 한 바 있다. “조각은 작품의 원형을 만들고, 석고 틀을 떠내는데, 이 과정은 필름에서 네거티브를 만드는 것과 같다. 또한 석고 틀을 조립해서 다시 원형을 만드는 작업은, 사진의 인화 과정과 다르지 않다.” 권오상은 사진을 비롯한 모든 아날로그적 복제의 메커니즘이란 결국 ‘원형-틀-복제물’의 시스템을 차용할 수밖에 없다는 점을 날카롭게 지적한 것이다. 사진과 조각의 복제성에 대한 또 다른 접근은, ‘데오도란트 타입’의 재현 방식이 지나치게 방만한 조각가의 게으름에서 기인한 것이라는 비판을 반박한다. 조각, 회화, 그리고 사진이라는 시각 예술 장르의 시작점에서의 본질적 목적이 자연과 대상에 대한 복제와 미메시스(mimesis)임을 인정한다면, 재현이라는 조각가의 몫을, 선택적 복제라는 사진가의 몫으로 대신하는 일은 창의적인 결합이자 시대적인 당위이다. 권오상이 ‘데오도란트 타입’에서 제시한 것은 사진과 조각 사이의 기술 혹은 의미에 있어서의 공통적인 지점을 넘어, 시대에 걸 맞는 새로운 조각의 가능성이었다. ‘데오도란트 타입’에서 사진조각이라는 장르를 개척한 권오상은 ‘더 플랫’에서 정물조각이라는 장르에 도전한다. 잡지의 광고 면에 가장 빈번하게 등장하는 시계, 보석, 화장품, 구두, 가방 등의 정물을 조각의 대상으로 소환한 것이다. 이 소재들은 잡지에 등장하는 횟수에서 착안한다는 사실만으로도 시대상을 반영하는, 오늘날 소비문화의 아이콘으로 자리매김한 것들이었다. 권오상은 이 적절한 소재들을 가지고 조각 공정을 가장 단순한 단계로 압축시킨다. 사진조각에서 조각의 무거움을 가벼움으로, 그 부피감과 밀도를 깨질듯한 속성으로 치환하였다면, ‘더 플랫’에서는 조각 공정의 난해함을 간단명료함으로 치환하였다. 권오상은 잡지에서 사진들을 오려내고, 그 뒷면에 철사로 지지대를 만들어서는, 평면들을 3차원의 공간에 자립시켜 조각의 지위를 하사한 것이다. 더욱 흥미로운 점은 권오상이 이 간단한 조각들을 최종적으로 우리에게 보여주는 방식은 사진 평면이라는 사실이다. 그러나 그는 결과물인 이 사진까지 ‘조각’ 장르임을 주장하는데, 사실 이것은 사진조각 ‘데오도란트 타입’을 조각에 편입시키는 것보다 조각성에 대한 보다 복잡한 논리적 추론을 요구한다. 조각의 가장 큰 특징적 요소 중 하나인 ‘입체성’은 작품이 표상하고자 한 대상이 입체적이라는 데에서 기인한다. 그러나 권오상이 ‘더 플랫’에 소환한 각각의 조각들은 3차원의 공간으로 진출했다 하더라도 본질적으로 평면이며, 따라서 감상자의 위치가 그 정면에 존재해야만 바르게 볼 수 있는 것이다. 그러나 인간의 두 눈은 공간감을 인식하여 측면을 살피고 후면을 예측하기 때문에 이 정방향성을 바르게 볼 수 없다. 그러나 공간감을 크기로만 가늠하는 외눈박이 눈, 카메라 렌즈는 이 평면적인 조각을 의도한 그대로 우리에게 전할 수 있다. 즉, 작가가 의도한 개별적 조각들은 사진기 안에서 틀을 만들었을 때에 온전한 조각으로 보일 수 있으며 그 상태에서 더욱 견고한 조각으로 존재하는 것이다. 우리 눈앞에 생생하게 펼쳐지는 ‘더 플랫’의 견고하고 번쩍이는 이미지들은 겹겹의 장막을 걸치고 아득하게 먼 곳에 있다. 그것이 지시하는 대상은 원본을 알 수 없는 대량 생산된 공산품이며, 이 공산품들이 카메라를 통해 촬영되어 필름이 현상되고 인화된 것이고, 다시 잡지매체의 대량 복제 과정을 거친 후, 작가의 카메라 속에서 형틀이 만들어지고 주물 된 후에야 비로소 우리의 눈앞에 선보이게 되는 것이다. 그러나 오늘날의 모든 것이 그렇듯, 원본이 실재하는지를 믿기조차 어려운 이 조각은 원본보다도, 심지어는 잡지 광고의 지면에 등장하는 그 직접적 대상보다도 선명하게 우리 앞에 펼쳐지고 있지 않은가. 권오상은 ‘더 플랫’에서 평면적인 조각의 가능성을 실험하였으며, 시각과 환영, 실재와 이미지 사이의 관계를 넘어, 오늘날 이미지와 이미지 사이에 발생하고 있는 요소들에 관한 연구를 마친 것이다. 사진 조각과 평면 조각, 그 후. 권오상은 레디메이드 자동차가 작품의 자격으로 갤러리에 반입되는 시대에, 청동으로 슈퍼카를 만들었다. 조각의 무게를 조소하듯, 가볍고 간단한 작업을 지속해온 작가 권오상이, 조각이 택할 수 있는 가장 전통적인 방식과, 그것을 연상할 때 가장 먼저 떠오르는 보수적인 재료를 선택한 것이다. 권오상은 조각이란 무엇인가를 보여주고 싶었다고 이야기하지만, 슈퍼카 ‘무르시엘라고Murcielago’를 청동으로 떠낸 거대한 작품 앞에서, ‘고귀한 단순과 고요한 위대’라는 빙켈만(J.J. Winckelmann)의 그리스 조각의 감동을 기대하는 것은 무리다. 애초에 차가운 논리가 어울리는 작가 권오상에게서, 파편과 정신분산의 시대에, 끈끈하거나 진한 감동을 주는 작업을 기대하는 것 자체가 넌센스인 것이다. 진한 오렌지색이 두껍게 도색된 채 주변의 넓은 공간을 꽉 채우는 권오상의 새 작업이 전하는 기분은 감동 보다는 압도감과 당혹스러움에 가깝다. 그것은 회화에 대해 끊임없이 연구한 페인터만이 낼 수 있는 기묘한 발색처럼, 조각을 끊임없이 연구한 조각가의 작업이 담고있는 밀도나, 바닥에 낮고 넓게 깔린 조각을 처음 마주했을 때의 시각적 충격에서 기인하기도 한다. 그러나 그 압도감과 당혹스러움의 근원은 보다 심리적인 부분에 있다. 그것은 무의식적으로 욕망해 왔지만 실현을 기대치 않았던 것이 눈앞에 펼쳐졌을 때의 전율에 가까운 감각이며, 오늘날 그 자리에 반드시 있어야만 할 것 같은 작품을 마주했을 때에 느낄 수 있는 시대정신이다. 권오상은 ‘더 스컬프쳐’를 두고 “사실 청동으로 슈퍼카를 만들었다는 이야기로 끝나는 것이다.”라고 이야기한 바 있다. 그러나 나는 이 짧은 에세이를 통해 권오상의 새 연작에 “새로운 시대에 걸 맞는 조각에 대한 끊임없는 연구의 산물”이라는 이야기를 덧붙이고자 했다. ‘더 스컬프쳐’가 아니더라도, 아직도 제작되고 있는 ‘데오도란트 타입’과 ‘더 플랫’의 신작들을 바라보고 있자면, 더욱 밀도가 높고 견고해졌음을 느끼며 조각성을 강조할 수 밖에 없게 된다. 그것은 작가 권오상의 정체성에 대한 오해가 풀리는 데에서 비롯되는 것이기도 하지만, 그보다는 사진을 통해 끊임없이 조각과 현대성에 대한 의문을 제기하면서 시작된 권오상의 연구가, 오늘날의 조각이 어떻게 더욱 조각다운 감동을 전해줄 수 있는지에 대한 답변을 제시하는 데에 가까워지고 있기 때문이다. 나는 권오상의 작업에서 조각의 시대가 도래함을 예감할 수 있었다. 최근의 페인팅이 전통적인 기법과 현대적 소재들을 결합하며 ‘회화의 승리’를 이끌어 냈듯이, 가장 전통적인 기법을 동시대와 결합시킨 권오상의 작업은 조각의 그것을 위해 한 발을 내딛는다. 이제 막 조각의 귀환이 시작된 것이다.